In December 2015, an historic agreement was reached among 195 nations in Paris at the the 21st Conference of the Parties (COP21) of the U.N. Framework Convention on Climate Change (UNFCC) to combat climate change and work towards a low carbon, resilient future, calling to keep global average temperature increase well below 2 degrees C, and to drive efforts to limit the temperature increase even further to 1.6 degrees Celsius above pre-industrial levels. The agreement also aims to strengthen the ability to deal with the impacts of climate change, such as shorelines, melting polar ice, and health hazards, to name a few. “The Paris Agreement allows each delegation and group of countries to go back home with their heads held high,” said Laurent Fabius, president of COP21 UN Climate Change Conference and French Foreign Minister. According to a conference press release, the agreement commits all countries to “aim to reach global peaking of greenhouse gas emissions as soon as possible . . . and to undertake rapid reductions thereafter.” It includes 188 national government submissions – Intended Nationally Determined Contributions (INDCs) – containing the actions each country intends to take to reduce greenhouse gas (GHG) emissions. Mazria says that these initial INDCs submit to the UNFCC, what they are going to do to lower their emissions and reduce GHG. Given their particular circumstances. In the agreement, they have all agreed to a review every five years and to increase their targets and the reduction targets. The current U.S. INDC pledge is to reduce greenhouse gas emissions 26% to 28% below 2005 levels by 2025. The most important thing this agreement does is 1) it lays out publicly what each country is going to do and 2) it sends a message to the markets that this is where the world is headed, Mazria points out. This will shape how building and developing take place and also what kind of power will be used if all emissions must be phased out by the middle of the second half of the century, CO2 emissions by about 2050. Both developed and developing nations signed on. China has huge problems with pollution and a huge energy demand as a result of their fast infrastructure growth. They’ve embarked on a clean energy and sustainable energy pathway, and have signed agreements to that end. 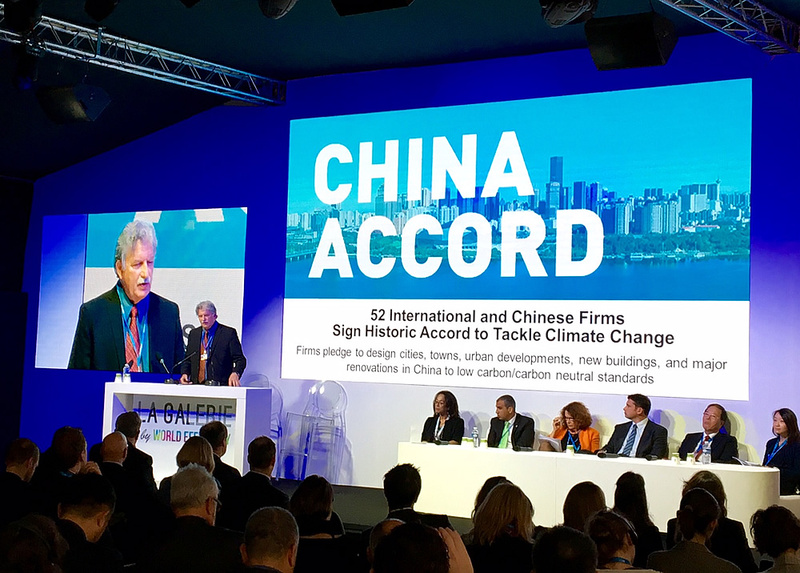 Just recently the China Accord was signed with 52 international architectural planning firms in China and the Chinese architectural planning firms signed an agreement to pursue zero carbon development, solidified and set out the roadmap. Mazria presented the China Accord on Buildings Day. 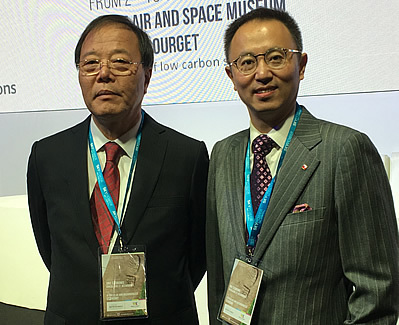 “The China Accord is a manifestation of the determination and moral obligations of planners and architects both in China and internationally, that we are taking huge strides to reduce carbon emissions and move towards zero carbon,” said Chen Zhen, Secretary General of the China Exploration & Design Association – Architecture Branch (CEDAAB), in a speech on Buildings day. Mazria delivered the opening presentation on Buildings Day titled “Road to Zero”, which set the tone for the rest of the day. Referencing Architecture 2030’s submission to the UNFCCC – the Roadmap to Zero Emissions: The Built Environment in a Global Transformation to Zero Emissions report – he demonstrated how a combination of reducing the built environment’s demand for fossil fuel energy while increasing the world’s supply of renewable energy sources will meet the Paris Agreement’s long-term 1.5°C goal. Many alliances were formed, with 1,000 representatives from local governments, and pledges by cities to reduce emissions. Most of the emissions — 75% — come from cities worldwide. Many private sector companies are pledging emissions reductions also. 2255 cities and 2000 companies have made commitments. There were separate agendas for cities and states at the conference. California has an agreement called Under2MOU between states and provinces and regions worldwide. It began with a few states in the U.S. and Canadian and Mexican provinces and states, and by the time they announced it in Paris, French provinces as well as others all over the world have signed onto this agreement to reduce emissions. The technology is available and ready for reducing emissions. Collection of sunlight has been a big issue but now that is solved and the next issue is storage of power. These alternatives will be less expensive and less damaging than fossil fuels. China’s enthusiasm is infectious. They produce most of the worlds GHG, and they are ready to take action with their five-year plan for sustainable development, lower emissions and getting their air quality under control. Once that happens we will most likely see India and other countries follow suit. This entry was posted on Saturday, February 13th, 2016 at 9:47 am. You can follow any responses to this entry through the RSS 2.0 feed. You can leave a response, or trackback from your own site.